Author Deborah Hopkinson shares her process of writing Ordinary, Extraordinary Jane Austen and the role children’s librarians play in supporting the dreams of their young patrons. What motivated you to write a book about Jane Austen for young readers? I’ve been an Austen fan for a long time. I was perhaps in sixth grade when I first discovered her books. I still have a few old battered paperbacks from those days. And I once took my daughter on a “literary pilgrimage” in England. And yes, we went to Bath. I don’t anticipate young readers to rush out and devour Pride and Prejudice, of course. But I think it’s wonderful to give readers the chance to discover accomplished women of the past from all cultures. And Austen offers a model for an ordinary person determined to follow her own path, which seems especially relevant in our celebrity-focused culture. What do you most appreciate about Jane Austen and how did you share that information with your audience? The painstaking revision work she did, including reading her books aloud again and again, and not giving up on her dream of being published are all aspects of Austen I tried to include in the story. What was the greatest challenge in sharing Jane Austen’s story in a picture book format? Well, let’s just say I struggled (a lot more than Austen ever did) in writing this book. Obviously, it’s a little easier to find a way in to someone whose life is full of adventure and drama. So I tried to focus on the fact that Austen was a child who loved to read, as many young people I meet are. I also wanted to show that although she later became famous, she was ordinary, like us. She loved her family and friends. She didn’t have a lot of money and didn’t travel to far-away places. Yet she had a dream and worked hard. What is your collaboration like with illustrator Qin Leng on this book? Qin Leng’s illustrations entice us into Austen’s world, I think! And I was delighted that the book’s wonderful editor, Donna Bray, shared her sketches with me throughout the process. I love the light, airy feel of the artwork and how she makes a mostly unfamiliar time period accessible to young readers. The style seems perfectly suited for a book on Jane Austen. I love the scene toward the end with diverse readers immersed in their books. Your book invites readers and listeners to reflect on Jane Austen’s life as a young child both at the book’s beginning and conclusion. What is the background on that decision? 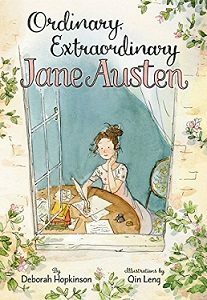 Ordinary, Extraordinary Jane Austen is nonfiction, and so I was careful not to include any invented dialogue. Yet I wanted, somehow, to convey to young readers that it is often events and passions from our childhood that help determine the work we may do or the paths we might take as adults. You don’t have to wait until you grow up to get started as a writer, an artist, a soccer player, a gardener, a scientist. 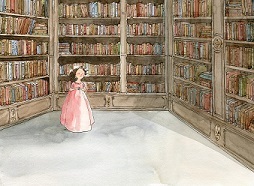 So returning to a confident, determined Jane, standing alone in her father’s grand library, full of books largely written by men, seemed like a fitting way to end. And Qin Leng captured this so beautifully! While Jane Austen’s father encouraged her gift, your book clearly conveys the barriers in place for girls and women. How can youth services librarians support our patrons when they are faced with barriers in their lives? As I visit schools and libraries across the country, I am constantly amazed by the dedication of educators and librarians. I see so many schools and libraries that are at the center of vibrant, nurturing learning communities, where children feel safe, respected, and empowered. I can only thank librarians for all they do. What information was most surprising to you as you researched Jane Austen’s life? I knew some about Austen before beginning the project. For my research I purchased Deirdre Le Faye’s monumental work, A Chronology of Jane Austen and her Family, which constitutes a chronology of 15,000 entries. One of the most surprising things was, of course, that Le Faye was able to reconstruct so much of Austen’s daily life, despite the fact that some of Austen’s letters were destroyed. Perhaps the most surprising thing is how much we do know of this family who lived two centuries ago. And, of course, we would wish to know more, especially about Austen’s feelings about her work. But, in all likelihood, she didn’t need to write about that in letters: it would have been apparent to her family. What role do libraries play in your research process? I depend on libraries (and museums) a lot, whether it’s archival research at a university library, or locating a photograph or oral history transcript. I also appreciate the ever-expanding role that libraries play in our communities. Here in Oregon, I’ve had the chance to present in several rural libraries. 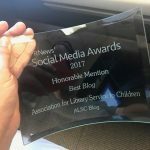 It’s truly inspiring to see how libraries bring community members together and provide so many services. 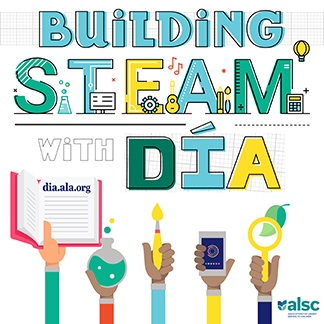 How can librarians successfully encourage their child patrons to be their most extraordinary selves in an ordinary world? I think librarians do a fantastic job. When I speak at school family nights or at library events, I focus most on encouraging parents to read with their kids, including teenagers. That might be reading the same books, or it might mean pairing an adult book with a picture book. Ordinary, Extraordinary Jane Austen provides some fun opportunities, I hope. It might be a chance to watch a film adaptation of an Austen novel together (and remember, there is a younger sister in Sense and Sensibility), or to discuss how women’s roles have changed since Austen’s time. I once read an article about how retailers pair ties and socks in stores to suggest color schemes to consumers. In a way, I think library displays can work a little like that. They help patrons imagine a literary experience. I’m about to head out for a busy spring of author visits all over the country. In addition to reading to find future ideas, I’m hoping to not watch the news while on the road. Instead, I think I’ll escape into a good Jane Austen novel. Thanks again to Deborah Hopkinson for appearing. For other stops on the Jane Austen Blog Tour, please check deborahhopkinson.com.